Conceived as a participatory nomadic monument, ŠTO TE NEMA travels to a new location annually, enabling different communities to commemorate the Srebrenica genocide collectively and in a public space on its anniversary. The monument consists of a growing collection of fildžani, small porcelain coffee cups, continuously collected and donated by Bosnian families from all over the world. The total number of fildžani roughly corresponds to the growing number of body remains found, identified, and buried to date. 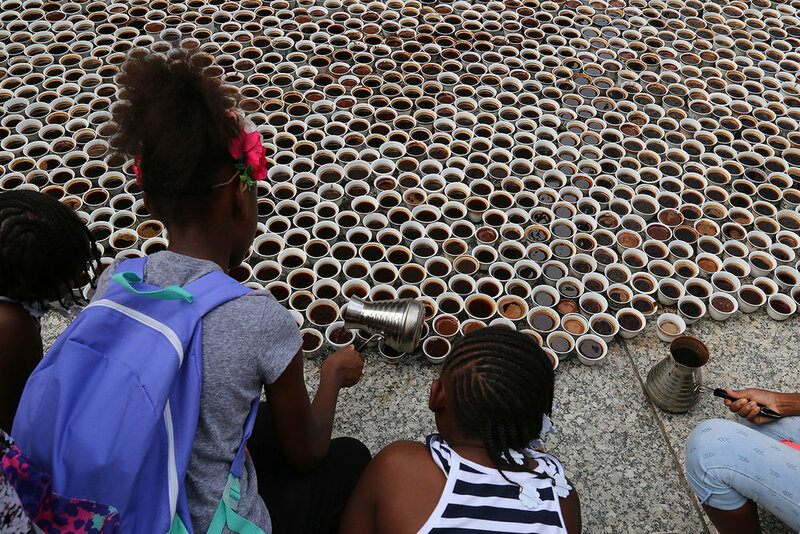 Every July 11th, the public is invited to participate in the making of the monument by placing the collected cups on the ground and filling them with Bosnian coffee prepared on site throughout the day. The 12th edition of the ŠTO TE NEMA nomadic monument was co-led by project coordinator Asja Dizdarević, and organized in partnerships with the Bosnian and Herzegovinian Club of Chicago, the Bosnian American Genocide Institute and Education Center, the Bosnian-North American Women’s Association, the Bosnian Islamic Cultural Center, the Islamic Cultural Center of Greater Chicago, the Society of American Bosnians and Herzegovinians, the Bosniak Cultural Community Preporod of North America and the Association of Srebrenica Survivors.